International Data Corporation and Strategy Analytics published their reports on the global smartphone shipments in Q4 and the full year 2017. The data reveals that Apple shipped 77.3 million iPhones in Q4 2017, most of any other manufacturer. For the full year, Samsung held its top position, shipping more than 317 million phones. Xiaomi impressed analysts by almost doubling its shipments - 28.1 million between October and December 2017 versus just 14.3 million for the same period in 2016. The holiday season brought anything but smiles to manufacturers with 4 out of 5 top companies registering a decline in shipments YoY. According to Strategy Analytics, the period marked the “biggest annual fall” in smartphone history from 438 million shipments in Q4 2016 to just 400 in Q4 2017. 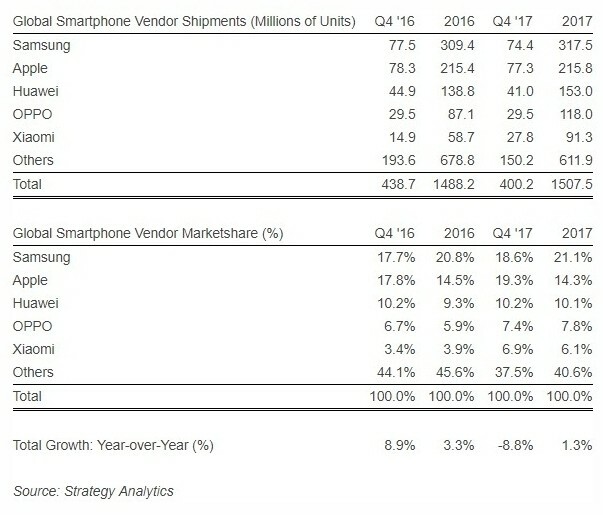 According to both analyst companies, one of five shipped smartphones in 2017 is a Samsung. Apple stays second with 14.7% market share, followed by Huawei and Oppo, keeping the Top 4 the same as in 2016. Although data from Strategy Analytics and IDC differs a bit, both companies report shipments for the past 12 months of around 1,5 billion smartphones. The amount is almost the same as in 2016, revealing a massive oversaturation of the market.